Hell, Mercury, student religion, the results are in, the Commie threat, pages and pages of Simanek and more! Iron core: Mercury - Quite a dense subject. Judge errs - Should public universities be funding religious student organizations? Editor’s Choice: 2007 Psychic Contest Results! - Not to gloat, but I won! From the Archives: McCarthy was right? Communist threat lives? - vrwc cites Ann Coulter as an authority on the “McCarthy myth” and the fun begins! Click on to any of these areas and you’ll get more things to click on to, to look at and read. And all of them are fun! Donald Simanek’s Pages is a fabulous site! Sunday: Chat was on vacation, again. Wednesday: Political talk from last week spilled over into this week’s chat. However, it was rather short-lived as more pressing issues were at hand. Talk of the upcoming TAM6 (which will now be held in June) spawned the planning of TLTAMOSFNS2 (The Less-Than-Amazing Meeting of SFN Staff, 2). This will likely be held in June as well. The night came to an end with a story of a marriage proposal and science fiction talk. 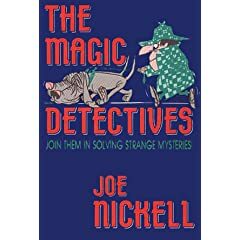 The Magic Detectives: Join Them in Solving Strange Mysteries, by Joe Nickell. Joe Nickell realized that a mere series of debunking stories might hold a child’s interest, yet not kindle the development of critical skills. If children could be fully involved in the investigation of strange occurences… if the investigations could have all the thrill of a ghost story yet reinforce rational over irrational thought, and science over superstition… then the book as a whole would be an appealing introduction to logic, critical analysis, and the scientific method in action. In The Magic Detectives, Nickell presents thirty ‘paranormal’ investigations in the form of brief mystery stories. Clues are embedded in each story; at the end of each account, the child can turn the book upside down to reveal the conclusion that professional ‘magic detectives’ have already reached. Included are examinations of the ‘mummy’s curse,’ bigfoot, haunted stairways, the Amityville Horror, the Loch Ness monster, poltergeists, and more. There were 9,484 daily visitors this week.